Posted bySareesh Sudhakaran	 November 8, 2013 May 15, 2016 1 Comment on Camera Trends over the last Decade: What does the Future hold? It won’t be long before we get a 40 MP video camera. Everybody else will just have to keep up. 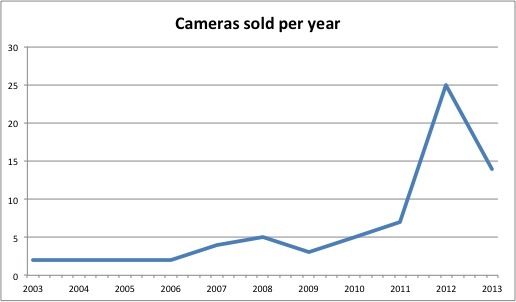 In this article, I look at the number of camera models released over the last eleven years (2003-2013) to find out if there’s any pattern in where we’re headed. What’s the point? I don’t know. I thought it would be fun. Or serious business. Those who invested heavily in film gear in 2001-2 will have surely felt the paradigm shift by now. Is trying to predict what will happen ten years from now such a bad thing? You decide. 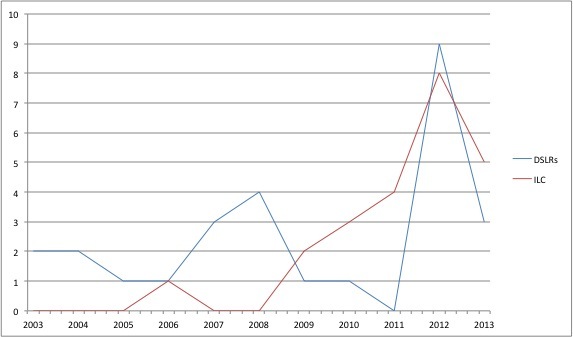 I’ve collected data from various sources, but mainly from Wikipedia. It’s not always easy to pin down exactly when a camera was released. Sometimes, a manufacturer announces a camera and it’s already in shelves or stores. Other times, a manufacturer announces a camera with a shipment date and months pass by. To make my life easier, I’ve divided camera releases by the quarter. 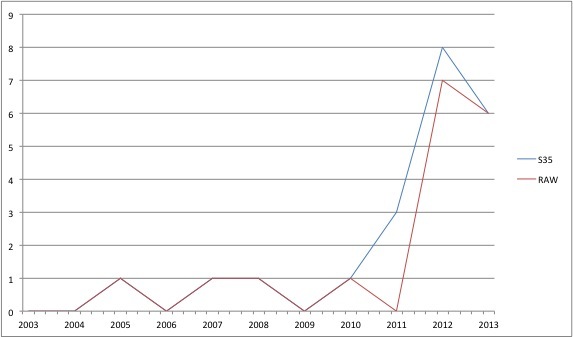 Data is from 2003 to 2013, which makes it eleven years, or 44 quarters. I’ve left out CCD or similar video cameras for ENG, sports, documentaries, etc. The number of professional-grade CCD video cameras released each year has been falling steadily for some time, but the main reason I left this group is because I can’t find reliable data over the past ten years. There is no concrete method to my madness, but my goal is to find general industry trends rather than make statements about specific models or manufacturers. This kind of grouping obviously means some data is left out, misinterpreted or plain wrong. So, don’t take much of it seriously. If you want accurate results, conduct your own research and tests. The total number of professional cameras released is about 70. If you add the brands and models I’ve left out the figure would reach about a 100, released over 11 years. That’s about 10 a year on average, and includes still and video cameras. 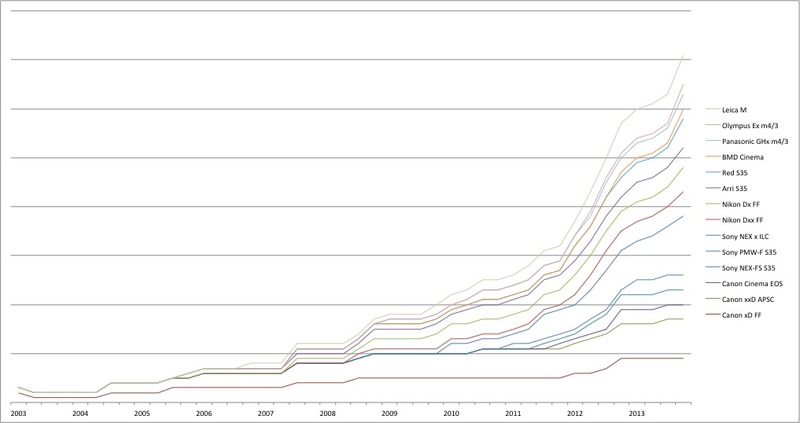 As you can clearly see, more models are being released per year than ever before. The growth is exponential. What’s strange is that fewer models have been released in 2013 than in 2012. 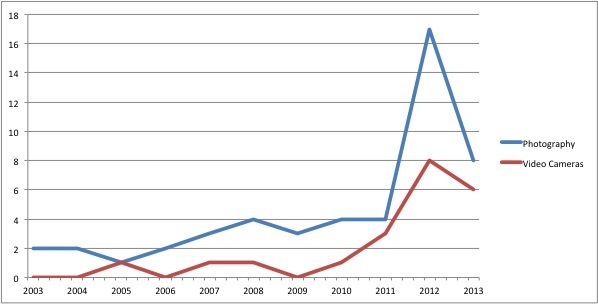 Till 2006, there’s hardly any correlation between the two industries. After 2007, roughly from the time the Canon 5D Mark II became a legend, there is a strong correlation between the number of still camera models and video camera models released every year. The correlation is greater than 0.9. This tells us, in no uncertain terms, that the future of stills and video is intertwined. Which manufacturers release the most models? There is one major surprise, and that is Red. The number of models Red has been able to release (they only started in 2007) is higher than Canon or Sony over the same period. In fact, Arri has released more Super 35mm cameras than Canon. Now we know who were caught sleeping. 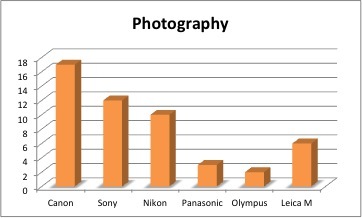 The only manufacturer that has a strong showing in both industries is Sony. Even though the market as a whole dropped this year, it is easy to see that MILCs are the new DSLRs. Electronic Viewfinders are improving by the day, and the extra mirror assembly and size is hard to justify anymore. You see, RAW video is easier for the manufacturer to dole out, because it reduces the thinking they have to do about color spaces, gammas, and all that crap. You asked for it, now deal with it. Why are new models released more frequently? Here’s the thing. 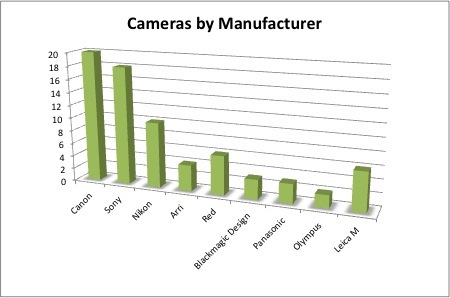 The formula allows us to calculate how many cameras are released per quarter, per manufacturer (as a simple average). This year, we are at the stage where every manufacturer must release one model per group every year, to stay in the game. Look around you, it’s already happening. If we look merely two years into the future, we see that, by the end of 2016, a camera manufacturer must release one model every quarter, in each group! That’s only two years away! Obviously, that kind of output is hardly sustainable. 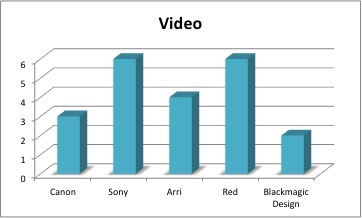 Only Sony comes close to such output, but even their business is not doing very well. The manufacturers know this better than anybody, so this is probably why the number of models released this year has actually dropped by almost 50%! Manufacturers realize that releasing newer models is madness, so the better strategy is to release a camera that is capable of being upgraded by firmware. The Sony PMW-F5 and F55 are some strong examples. Sony drew an entire firmware update roadmap, which means they knew the potential of the cameras. Rather than putting out a new one every three months, they decided they’d deliver cameras with as much potential as possible, only limited by market pricing. Of course, Sony is able to do this because they also manufacture the sensors. Those who are dependent on third-party sensors cannot always create such long-term roadmaps. To answer the question posed by the heading of this section, I believe this rapid rate of development is not being caused by the explosion of smartphone and tablet usage worldwide. Almost every handheld device has a camera, and many have two of them. Most modern smartphones are capable of 1080p, and the models released this year even go up to 1080p60 (The iPhone 5S can do 120fps but the resolution looks like it’s 480p). Those who want to shoot snapshots or quick videos no longer need to hunt for a camera as a separate device. However, a professional will not turn to a smartphone anyway, and our data is all about professional grade cameras. So how can handheld devices impact professional camera usage? The first is the integration of stills and video on the same device. When this happened in the professional realm (Canon 5D Mark II), all hell broke loose. The results are obvious: Canon 1DC, Red Epic/Dragon, GH4, Leica M240 with video, etc. The second, probably the most important without which the first reason wouldn’t have been possible, is cheaper sensors. Cheaper sensors available to all manufacturers. Integration of video and stills just because it’s possible in a CMOS sensor. If you integrate them, then the sensors become cheaper to manufacture. The result? Expect all future cameras to shoot both stills and video, and we’ll no longer have separate industries at least as far as hardware is concerned. Higher resolution cameras are the future, so I would side with Red in this case. Shoot all footage in 4K and above, if you want to preserve it or earn from it in the future. Learn to live with electronic viewfinders. It’s going to make you Iron Man (haven’t you heard of Google Glass?). Expect to buy a sensor housed in a body, or even piecemeal, and then integrated with small computing devices like smartphones, circuit boards, etc. The SI-2K Mini comes to mind. Smaller and lighter lenses will win in the long run. The Sony E-mount (FZ as well) seems to be the most brilliant solution in this regard. Does this mean the others will be forced to create new mounts? Once manufacturers reach these limits, they’ll turn to internal filters, even higher ISO (Canon is doing this already), higher frame rates, power savings, etc. Better get good at shooting stills and video at the same time. All this will need solid wireless technology. Expect to buy one camera and update it over a two-year period. This is happening already. Don’t buy a camera which will be under-spec’d two years from now. Expect prices to drop quickly from here on. Every manufacturer has reduced prices over the last ten years. A Sony F65 goes for $30,000 used, and a Leica M 240 costs less new than a Leica M9 did when it launched. And that’s not considering the inflation factor. Judging by what Blackmagic Design is capable of putting out, I think any camera over $10,000 will be overpriced. Guess what’s not going to change? Audio. What do you think? What’s your take on the above analysis? It’s only a hunch, but I believe more single purpose cameras will appear, instead of more integration. Video and stills are definitely two different areas of expertise. They’re OK merged in consumer devices, but don’t make much sense in professional or even some “prosumer” equipment. I expect more BMCCs-like cameras and I know a number of professional photographers who couldn’t care less about video. It seems to me the reason dual purpose cameras exist is because once your sensor can stay on for long periods (which you need for mirrorless) and your processor is powerful enough (an area which more or less still follows Moore’s law), adding video is just too easy, but it feels bolted on even on high end Canons and Panasonics. I expect Panasonic to fight back the BMPCC sooner than later, maybe Sony too. I can see Nikon focusing more and more on stills-only equipment and leaving high end video behind. I can see many conflicts in Canon extensive line (they need to push video pros to higher priced models and a way to do that is cripple video on stills cameras). The same with Sony. Regarding lenses, I expect MFT to rule in video -E-mount second maybe- among third party manufacturers, and also expect motorized zooms for the likes of the G6 or the upcoming GH4. In a more distant future (5-10 years? ), I foresee huge megapixel counts replacing mechanical and complex zooms. Just have a wide angle high quality prime and do the rest digitally, much like the 40MP Nokias do in the phone industry. I’ll re-read your data in depth at a later time and maybe I’ll add something.